Neighborhood Medical Center knows the importance of supporting our community. 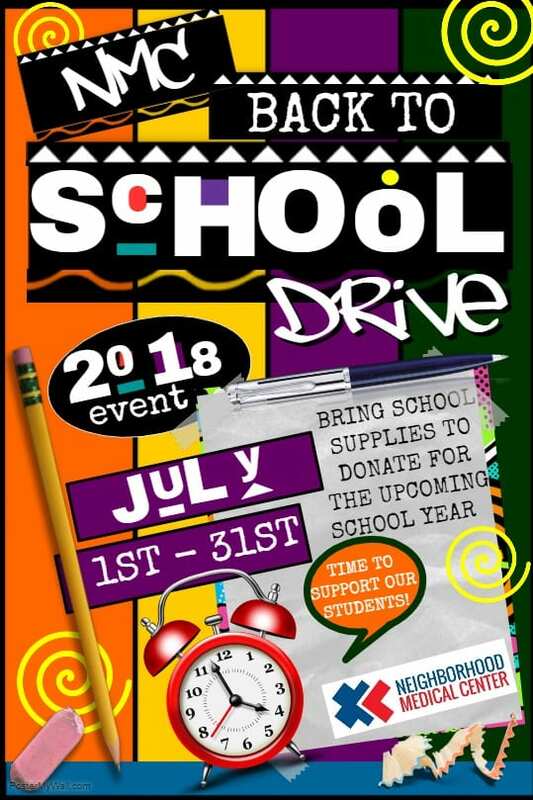 Neighborhood Medical Center is hosting a back-to-school supply drive and we are asking for donations to help give back to those families in need. The donations are completely voluntary. You can drop off any donations to any of our location to help NMC to support our students in the upcoming school year. Paper, pencils, pens, crayons, colored pencils, rulers, safety scissors, binders (all sizes), glue sticks, folders, backpacks, etc. If you cannot get to any of our location you will be able to join us at Stuff the Bus on August 4, 2018 from 10:00am – 3:00pm. The location of the Stuff the Bus event is TBA. Thank you so much for helping the students to a good start back to school.